Like most young people, I initially wanted to move away from home after graduating from law school, but instead, I chose to return home. The decision was based on my desire to serve those who had helped me reach my potential, as well as those who were often underserved and overlooked in my community. Being offered the opportunity to be a 1992 CLEO fellow and study at the Southern University School of Law prior to attending Mercer University also inspired this decision to give back. CLEO is a valuable program geared towards increasing the number of minority lawyers in the United States. While in law school, I earned an internship with the National Labor Relations Board and Georgia Legal Services in Macon. Since returning to Albany, I have opened a private practice that specializes in the areas of personal injury, workers’ compensation, divorce, adoption, and other domestic areas, as well as real estate, wills and estates, and juvenile law. Out of all the cases I handle, my work in adoption and juvenile law are the most rewarding. My adoption practice works towards bringing families together, rather than taking them apart, while working in juvenile law allows me the opportunity to positively impact both my community and the members of the next generation. My desire to practice law that helped others, particularly children, was sparked by an article I read earlier in life about a family that had nearly been destroyed when their children were put into foster care based on a lie. I currently serve as a public defender representing parents and children in the Division of Family and Children Services cases. After serving thousands of clients over the past 17 years, I am still eager to serve those who need effective, dedicated, and reasonably priced legal services. We are here to help you with your legal consultation needs. 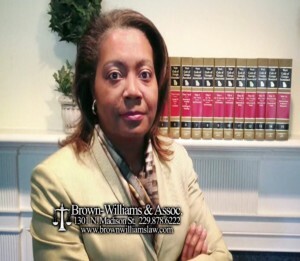 "Dear Ms. Brown-Williams, Thank you for your assistance and more so your patience with us for services rendered for the adoption of our son. I thank you and want you to know how truly appreciative we were of your services."